I am what you might call an academic extrovert. Even though I am somewhat of an extrovert in the classroom, outside of the classroom, I am extremely introverted. There are still some parts of the classroom that make me fearful, and that is public speaking. I have become much better at this over the years (especially in the last year since I have started graduate school.) Giving presentations can be scary, but they don’t have to be. Here are my tips for getting over presentation jitters. One of the easiest ways to stop presentation jitters is being familiar with your classmates. If you know your presentation date is coming up, participate in your class. Make it a point to get to know your classmates before and after class and become more comfortable with them (or at least a handful of them.) Over time, the more comfortable you are with your classmates, the easier giving speeches will be. Earlier this semester I agreed to go first in a presentation, which is something I hardly ever do. I’d done a presentation with the professor before this class and I knew a lot of the students in my class so it was easier for me to get up and do the first presentation of the semester. Now my presentation is done and it’s a big assignment that I don’t have to worry about for the rest of the year. Crazy, right?! I wouldn’t have been able to do that if I didn’t already know so many of the people in my class. Sometimes you don’t know your classmates or you are taking a general education class with a bunch of strangers. Make it your mission to talk to many of the people around you and participate in class so you get used to talking and sharing your opinions. Don’t hold back with your participation, this will make you feel more comfortable on your presentation day. The worst thing you can do during a presentation when you are nervous, is wait until the last minute. You want to give yourself time to write the presentation, make slides based on the presentation, and practice said presentation. It may be easier to wait until when you feel more comfortable with the course and the people in it, but until you get in that mindset, be careful about procrastination. If you have time to prepare for your speech, make sure you are using as much of that time as possible. Even if the first few days are just reading the instructions or doing something simple. Try to get something done on your presentation each day after you find out you are giving one. Rubrics are your best friend when it comes to presentations. If you can get an understanding of how you will be graded, your life will be so much easier. What is your professor looking for in each presentation? Once you understand where most of your points will come from you can focus on those things instead of trying to understand every aspect of your speech. Are they looking for length, information, discussion? Understand what couple of tasks you really need to focus on and the rest can be worked on along the way. Most of your focus should be on the big three or four tasks that get you the most return on your investment. Rubrics can also be used to understand where you need to stand in each category to get the grade that you want. Say, you will be graded on a 50 point scale, and you want to get at least an A. That means you need at least 45 points. Then you can look at the categories and see where you can score better (and where you may not score as well.) After that you can determine where you need to focus your energy. You may have certain parts that you know you will do well on, so you may decide to focus on the parts that you won’t do instinctively as well on. Whatever way you decide to divide your time is up to you. You need to be familiar with the material you will be presenting. It’s really awkward to watch someone who hasn’t truly been exposed to the material they are talking about. You want to make sure that you get familiar with the presentation material so that you can talk about the material confidently. Take time to go down all the rabbit holes and find out as much information about the material as possible. Don’t get stuck trying to constantly come up with new material, your speech or presentation can only be so long. Know when to proceed and when to stop. When you are preparing a presentation and what to talk about in that presentation you need to know how long your speech is supposed to be and what your speech tendencies are. Is it just a five-minute presentation or are you putting together an hour-long presentation? Do you talk slower when you get nervous, or do you rush through things? If you know that you have a tendency to rush through things while you are in front of a classroom, you may want to have some extra material available to cover just so you fill the amount of time necessary. If you don’t want to bring up extra material, you can also focus on your breathing while you are on stage and remind yourself of that need to breathe while you are in front of the class. Be in tune with your body, notice when you are going a little too fast, and then slow it down. When it comes to speeches and presentations, the hardest part for me is definitely the transition. Flowing from one topic to another can be a very difficult thing to do. Focus specifically on how you intend to transition topics or how you plan to group things together so they make sense. What order do you want to talk about your topics? Video Icebreaker/Introduction: I showed a quick 6-minute video about gentrification and violent crime to the class. I thought this video was interesting and would be a good way to pull the audience into my presentation from the start. Then I asked a couple of questions and had a little bit of discussion about the video clip. Overview Article: One of our assignments that I was supposed to discuss during my presentation was an article called What Causes Violent Crime. This article was good as an overview article to the topic of violent crime so it was the first article that I discussed and asked no questions about. Sub Article 1: The next article we talked about discussed a very specific case of violent crime: gang-related violent crime. I thought it made sense as the next step article to discuss and ask a question about. This was an assigned reading. Sub Article 2: The next article I talked about riffed off of Sub Article 1. It shared one of the same authors and it talked about the same city as Sub Article 1. I decided it would also be a great article to discuss because it was about lead exposure and crime. Lead exposure has been on the news a lot lately thanks to places like Flint, MI and I thought it would pique a lot of people’s interest in my criminology course so I talked about the article and asked a question about it. Sub Article 3: Lastly, we were also assigned an article called Race, Economic Inequality, and Violent Crime. Since the previous couple of articles had mentioned race a bit I thought it would be an interesting article to cap off the article part of my presentation and ask a question about. Video Wrap-Up/Conclusion: To end the conversation I brought out another film clip from one of my favorite shows Last Week Tonight with John Oliver where he talked about how people feel about crime numbers going up versus the facts of crime trends and numbers going down. I thought it wrapped up the conversation really well. I also asked a few questions about this video. When I am doing work on my presentations, I am always thinking of how all my pieces and parts can best work together. The above presentation was written for a discussion leading so the point of the presentation was to introduce questions and have discussions. Your presentation transitions may be different than mine, but think of all your presentation pieces like a puzzle and figure out how you can move them so they fit together. I always get a lot less nervous when I know that all my presentation ducks are in a row. If your professor allows you to get there early to pull up your presentation, definitely do so. You will feel so much better knowing you either have your presentation, have time to fix it if something goes wrong, or maybe even have time to go get it if you can’t open it if you live close by. I say always have your presentation in two to three locations if you can (or have it in a location close by.) I am so lucky that I am usually working on my presentations in my office before class so usually, they are stored on my office computer if they aren’t in my email or on whatever device I take them to class in. 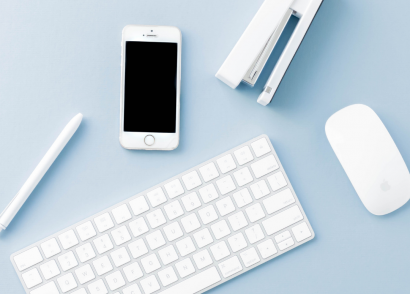 Store your presentation in multiple places: in a cloud-based service like Google Drive, on a flash drive, and/or in your email are probably the best places to store your presentation. When I am setting up my presentation for a course I usually open up my presentation file, then I open up all of my videos in a window so that they are loading (and so they don’t buffer or skip during the presentation.) Make sure that you also have anything you need for the presentation such as water, your notes, and a copy of your powerpoint. I like to have a copy of the PowerPoint so I can keep up with what’s on each slide during the presentation as more than likely the presentation will be shown behind you. Everyone is nervous. No one is a presentation pro, not even your professor. Part of what makes their presentation so flawless is that they are preparing for the presentation all the time. Your professors may have even given the same presentation multiple times that week or in their lifetime. They know the script, chances are they have been following the same one for a while. At the same time, I know that they still take time to prepare before every. single. class. Last semester I helped one of my professors by being a TA for his course. I only led class once and I still felt nervous before every class. I had a ritual of things I would do before every single class so that I could calm my nerves before heading down to class. Being in front of people is nerve-wracking, even when it’s not your primary job. All of your classmates are probably nervous about their presentations as well. I have seen extroverted people turn to mush when they had to give a presentation, I have seen introverts shine when they had to do their presentations. You have the power to get over that nervousness though. Going over your presentation over and over before your presentation will really help you out. My alma mater even had speech tutoring where students could go into rooms and record themselves giving their presentation so they could catch the ticks they had before class. What resources does your school give to students taking speech classes or students who have to give presentations in their courses? Utilize those resources. You can also just record yourself giving your presentation or enlist the help of a trusted friend to listen to your presentation before you give it. Practicing in front of a wide array of people will help you become more comfortable with the material and help you fix the issues that are in your presentation before you give it. 9. If You Can Get Other People To Participate, Do So! As you can see by the presentation transitions I showed you earlier, I love presentations where I can ask for audience participation. Are you leading a discussion or are you giving a speech? If you can get your audience to participate, depend on them to participate. Come up with not only questions but also follow up questions. You can come up with these on the spot or beforehand. If you see a conversation coming up, don’t be afraid to water it so it will grow. For example, one of the questions I asked during the presentation was all about how gentrification might impact poor people and what we could potentially do to reduce that effect. People weren’t as talkative as I’d like them to have been at first during this part of the presentation (I also had a time in my head that I wanted each part of my presentation to take.) so I thought about a particular initiative in my head that people use to control the impacts of gentrification (rent control) and I asked them how they felt about that specific thing as a mechanism to fight the effects of gentrification. Sometimes you think a question is a more open question, but it turns out that when you are reading it aloud, it’s more closed. Being able to have some follow up questions there to keep the conversation flowing is very important. The more you can get your classmates to talk, the less you have to talk. Think about that when you are giving your next presentation. Lastly, I will end this with one simple word: relax. This advice is great at so many parts of your speech from forming it, to practicing it, to actually speaking it. Relax, don’t be so tense, just try your best. If you take the time to relax; do everything you are told in your rubric; and give a detailed speech you will be just fine and dandy. Remember to breathe. Remember to relax. 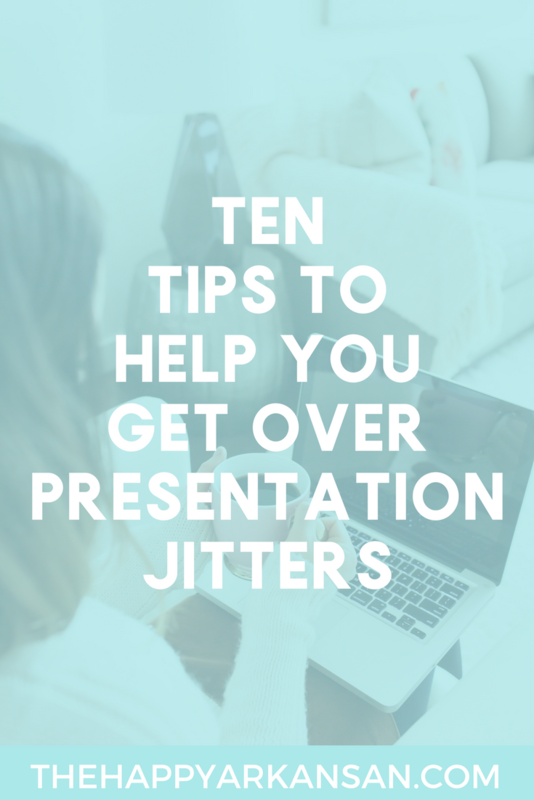 I hope you enjoyed this blog all about how to get over presentation jitters. Presentations can be scary, but they don’t have to be. As long as remember to relax, plan, and give the best presentation you can be you should be just fine. What is your best presentation tip? I love this! I wish I’d read this when I was still a student, more or less six years ago. In my current line of work (advertising), we still do a lot of presentations and some of these tips still apply. I think #4 (be familiar with the material) is one thing that a lot of presenters tend to overlook. Especially if it’s a group presentation, some members feel like they only need to memorize their parts. This is wrong. As a group, you’re accountable to a shared understanding of the subject. If I may add to this, this is what I’ve learned based on experience: It helps to be genuinely interested in the subject matter. Sometimes, it comes as a natural curiosity. Other times, you have to put in more effort to make the process enjoyable. I noticed that I feel a lot more at ease in front of an audience when a) I’m confident about what I know and b) I really care about what I’m presenting. Hope that makes sense! I totally agree in understanding the entire group’s material, not just your own! So many times I’ve presented and group members have zoned out, and when it came their turn to present they missed their cue, and others had to present for them! It really is a disservice to not only the audience but your group members. Bring 100%!